Colleen O'Grady, MA. is a speaker, trainer and author of the award-winning and best-selling book Dial Down the Drama: Reduce Conflict and Reconnect with Your Teenage Daughter---A Guide for Mothers Everywhere. Colleen shares her wisdom from twenty-five years of experience as a licensed marriage and family therapist which translates into over 50,000 hours of working with parents and teens. 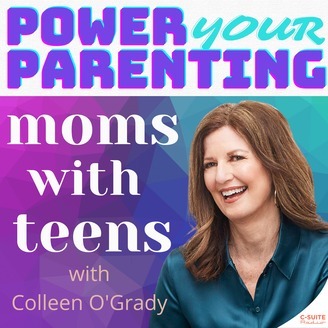 Colleen, known as the parent-teen relationship expert helps you raise the bar of what's possible for the teenage years. Colleen not only knows this professionally she has been a mom in the trenches with her own teenage daughter. 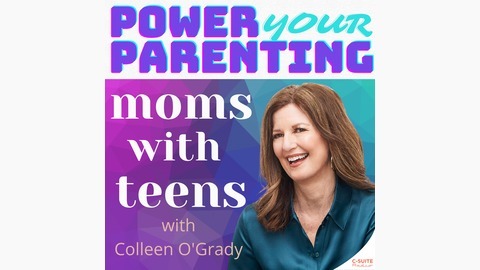 You really can improve your relationship with your teen and dial up the joy, peace, and delight at home and work, Every episode is geared to uplift you, give you practical parenting tips that you can apply right away and keep you current on the latest in teen research and trends. I think what's challenging and perplexing about parenting is that your child/ teen can feel like a moving target---or you could say a growing target. You feel like you finally have mastered one stage and then your teen grows out of it and you are up against the next stage. This new phase has new dynamics to figure out and its own set of perils. Every time you turn a corner, there is new terrain to manage. You finally have elementary school down and then they are off to middle school. You finally have middle school down and then they are off to high school, and then your kids are wanting to get their drivers permit and on it goes. . . Add to this moving or growing target another factor that can completely throw parents off balance and is the source of much confusion and frustration. This is the Maturity Gap. Maturity Gap in adolescence has been studied by many neuroscientists. They look at the maturity gap through the lens of brain development. They define it as the discrepancy between an individual's cognitive maturity and emotional maturity. I am going to broaden the definition of Maturity Gap and will share some interesting studies about the brain. Here's what I mean when I am talking about the Maturity Gap. All the different facets of your teen (physical, social, cognitive and emotional) are not growing together at the same rate. Because of this there is a maturity gap between the different parts. Some areas of your teen may seem more adult-like. You can feel like your teen is maturing and you can relax, but then your thrown off by another facet that screams immaturity. This Maturity Gap doesn't magically go away at 18, it's alive and well until age 25. This podcast will explore how knowing about the Maturity Gap can help you be a better, happier and wiser parent. #036 Are You Too Hard or Too Soft on Your Teen?